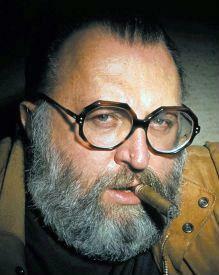 So, just who is Sergio Leone: King of Spaghetti Westerns? It would probably be hard for a lot of readers to imagine a time when Clint Eastwood wasn't a household name. Back in the early 1960's, however, the man who would become "Dirty Harry", an award winning director and mayor of Carmel, California was just starting out in his acting career. To Italian filmmaker Sergio Leone, Eastwood's lean looks and dispassionate style of delivering lines were exactly what he was looking for in a new breed of hero he could take to the box office. This new approach made him Sergio Leone: King of Spaghetti Westerns. Leone was born to a family already familiar with the demands of a career in the entertainment field. His mother was an actress; his father had already hopped the movie bandwagon during the pre-talkie days. By the time Leona became an adult and was ready to foray into filmmaking himself, American directors had made the discovery that it was not only more exotic but less expensive and less competitive to shoot productions overseas than on the back lots of Hollywood. This preceded the age of the Internet and the advent of virtual keyboard tours to exotic locations. Audiences who would never travel overseas got to be armchair tourists whenever a new crop of European-made films debuted. Like most directors, Leone honed his craft by learning from those he considered masters in the field. At the top of his list were Akira Kurosawa-a film maverick known for his experimental works and his propensity for pushing the envelope and taking enormous financial risks-and John Ford, a film giant whose name was synonymous with the western genre. Just as Kurosawa would one day have the vision to turn Shakespeare's King Lear into a feudal Japan version called Ran, Leone recognized that a good story could probably transcend time, space, and country of origin. That said, he used his admiration for Ford and his fascination with Kurosawa's 1961 samurai film Yojimbo as the jumping off point for a trilogy about cold-blooded vengeance in the American West. For his first spaghetti western to be a success, of course, Sergio Leone, King of Spaghetti Westerns, wanted a major star in the role of the nameless protagonist. Henry Fonda, Charles Bronson, Steve Reeves, and James Coburn summarily turned him down because the pay he offered either fell short of their expectations or else Leone's schedule conflicted with prior film commitments. Disappointed but not daunted, Leone recalled seeing a newcomer playing the role of Rowdy Yates in a U.S. television series called Rawhide. Not only did this young actor named Mr. Eastwood have the physique and demeanor befitting a man who lived by his skills with a gun, but he could also be hired for considerably less-$15,000-than an actor with name recognition. Clint's trademark squint, by the way, was something that he picked up abroad; with the bright sun constantly at the backs of the cameramen and Leone, most of Eastwood's lines were delivered as he looked straight into the sun. To save his new director some money, the film's entire budget was less than a quarter million dollars, Clint also brought along a wardrobe and some cigars he purchased in Los Angeles before he flew over for the shoot. Leone liked the overall "aloof" effect Eastwood projected and kept it in. Filming began on The Magnificent Stranger in Spain and Italy and immediately encountered its first obstacle: Leone and his crew didn't speak any English and Clint didn't speak Italian. Fortunately there was a stuntman named Benito Stefanelli who offered to run interference and translated what Clint's motivation was supposed to be in each scene. Ironically, one of the things that managed to get lost in translation was Leone's decision to retitle the movie just before it was released. Back home in California, Clint was starting to wonder when his film was going to debut, unaware that Per Un Pugno di Dollari (A Fistful of Dollars) was already a national hit and on its way to making him a major star. In yet another interesting twist, it seems there was at least one person who was not happy to see this movie released at all. Kurasawa, the very man whose work had inspired Leone to turn samurais into American gunmen, filed a lawsuit, claiming Leone had violated the copyright that existed on the previously produced Yojimbo. Kurasawa's infringement claim prevailed, and Leone's production company was forced to share 15 percent of the new film's profits with the Japanese. Who was that Nameless Stranger? 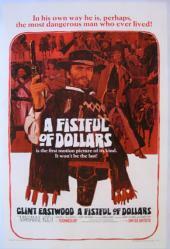 The popularity of A Fistful of Dollars encouraged Leone to keep Clint's hat in the ring and follow up with Per Qualche Dollaro in Piu (For a Few Dollars More), a sequel shot primarily in Madrid and Andalucia. Like many of his contemporaries, Leone used the medium of film as a way to express his personal views on the theme of man's inhumanity to man. The "kill or be killed" theme, Leone believed, was as prevalent globally and in modern times as it was in the less civilized era of the American frontier. That Clint's character had no name wasn't a screenwriting omission, rather an allegory for everyman who has ever been wronged by society and decides to take matters into his own hands. That themes of revenge and retribution spawned and perpetuated further acts of violence was reflective of the vicious circle that a cynical Leone felt typified the human experience. Unlike his peers who were glamorizing the Old West as a place where good always prevailed and true love was always worth waiting for, Leone was insistent on painting an alternative landscape through cinema-a landscape that was as harsh, cruel, and unforgiving as those who peopled it. By the time the swarthy anti-hero in the raunchy poncho made his third return-this time in Buono, Il Burtto, Il Cativo (The Good, The Bad and the Ugly)-Leone had an operating budget of a cool million; Clint-now a box office draw-garnered a salary of $250,000. While many of the film's fans interpreted the title to represent the three principal characters, Leone asserted that he meant for it to be symbolic of the good and evil sides that existed in all people and of the ugly deeds that were often performed in the name of either good or evil. He was also said to have used the backdrop of the Civil War as a platform to express his views on the "herd mentality" he found offensive in the world's escalating involvement in Southeast Asia. Further information about Leone's most popular trilogy of films, as well as an exploration of his later works-A Fistful of Dynamite, Once Upon a Time in the West, and Once Upon a Time in America,-be sure to visit Internet Movie Data Base. Book lovers seeking critical analyses of Leone's filmmaking style will find two excellent selections at Amazon. In particular is the July 2000 biographical release entitled Something To Do with Death, which chronicles Leone's obsession with outlaws and gangsters. Five years later, Once Upon a Time in Italy: The Westerns of Sergio Leone, supplements the Leone mystique with industry interviews, photographs from his productions, and sketches of how he envisioned his actors and settings should look.